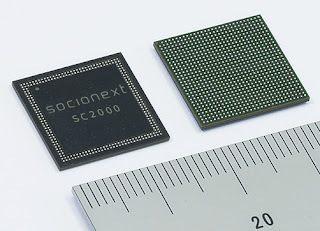 PRNewswire: Socionext introduces the SC2000, a new image processing IC designed for drones and action cameras. The SC2000 is a new product from the "M10V" series, an eighth-generation version of Socionext's Milbeaut Image Processors. The new SC2000 has a digital signal processor optimized for computer vision. It also features advanced functionalities such as 360-degree, real-time panorama stitching with four cameras, image stabilization without mechanical gimbals, and rolling shutter correction. The image processing rate is 1.2 gigapixels per second, three times faster than the company's previous processor, while the power consumption is as low as 1.7 Watt in typical operating conditions.